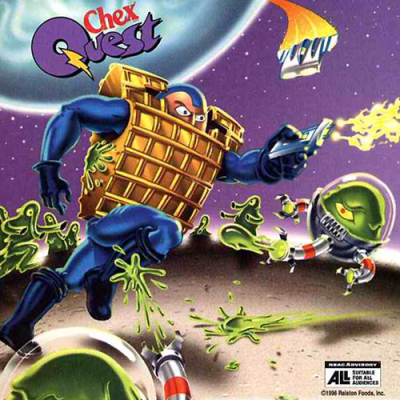 The Chex Quest series of games (Chex Quest, Chex Quest 2 and Chex Quest 3) has been developed and released in 1996 by Digital Café. Based on the DOOM engine, this game franchise was a non-violent variant of DOOM made as an advertisement program targeting children from 6 to 9, bundled in the Chex breakfast cereal packs to promote the product. The main character of these games being a piece of Chex cereal, who must fight an invasion of slimy green creatures, the Flemoids. NightFright, member of the Doomworld forums, recorded all the music tracks from the 3 Chex Quest games with Arachno SoundFont, BASSMIDI Driver and the AIMP audio player/converter. All versions included, this arrangement totalizes 3540 downloads so far.